TOF has been wiggling a loose tooth since Whynot's vacation. Just a teeny tiny bit, because he didn't want it to fall out while Pa was gone. This morning after brushing his teeth he came up to me and said I think I have another loose tooth. I looked, and sure enough he now had two loose teeth. We sat down to play Cootie and he wiggled away at the new loose tooth until it popped right out. Just like that, no blood, no tears and now one less tooth in his mouth. The first loose tooth still hanging on for dear life. I tried to coax him into wiggling it more and offered him a wet washcloth to chew on to help it come out. He wasn't having any of it. I thought biting into a Popsicle might do the trick. Going against every ounce of common sense that I have I offered him a nice sugary Popsicle before he even finished all of his lunch. I wanted that tooth out in the safety of my home, where there was no chance of it being lost once he left for school. When we were dealing with my mother in law's Alzheimer's our Dr. suggested therapeutic lying to get her to go along with things. I've been using it on kids ever since. Little innocent white lies. I tried telling him that he might get extra cash from the Tooth Fairy for more than one tooth. I told him that there might even be an extra gift along with the cash. I told him that I was worried he might drop the tooth at school and then the Tooth Fairy might forget to come at all. I was making up ridiculous stuff just to get that tooth out. He left for school with one gaping hole in his million dollar smile and one extremely wiggly tooth. What have you told your kids about the Tooth Fairy? And what is the going rate for teeth these days? Does a first tooth earn extra? Does loosing a tooth over the weekend earn a bonus? How about 2 in 1day? My Tink lost her first tooth on 1/1/11. The Tooth Fairy left a dollar. Pretty reasonable I thought. Hubbs felt she had been robbed and paid an extra $10.00 for the tooth. So, needless to say Tink is more excited to tell Daddy about lost teeth than she is a visit from the Tooth Fairy. 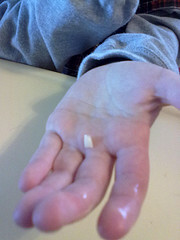 My son just gave up on the idea of the tooth fairy last week when his first canine tooth came out. Before that I went the extra mile to keep her alive, even crafting a letter from her when he lost two teeth on the playground. Hey, you won the drawing for Jumpstart on my site!